Councils and motoring groups have welcomed government proposals to introduce by-the-hour lane rental charges for road works but warned that the quality of repairs must not suffer. The Department for Transport (DfT) has also suggested creating a new 'super permit' scheme for works on the busiest roads. 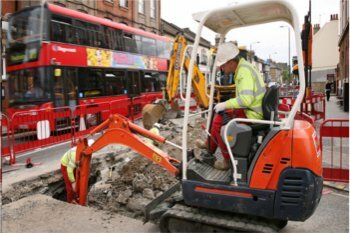 DfT officials said delays to drivers caused by utility companies digging up busy local authority roads could be halved, based on trials in London and Kent, where utilities firms can be charged up to £2,500 a day for carrying out works. Transport secretary Chris Grayling said: ‘These proposals would give councils greater powers to ensure utility companies avoid carrying out works at the busiest times and on the most popular routes. The DfT said that while around 60% of local authorities use permit schemes to monitor roadworks, lane rental would give them additional powers to manage works. Permit schemes provide an alternative to the notification system whereby a highways activity promoter will have to apply for a permit from the highways (permitting) authority, rather than informing the authority about its intention to carry out works. The Deregulation Act 2015 removed in England the requirement for permit schemes to be approved by the transport secretary. The DfT has said it would like to see all authorities operate a permit scheme, however Transport Network sources suggest councils that have not already adopted the scheme are unlikely to do so. The DfT is consulting on a series of options to make work by both utilities and highways authorities more efficient. Officials suggested that firms could avoid the lane rental charges by carrying out works during evenings and weekends or coordinating their plans. Baseline Option (do nothing). This would mean the current schemes in Kent and London would end in March 2019 and no new schemes would be permitted. Option 1: Retaining lane rental as it currently exists but only in London and Kent. Option 2: Roll-out lane rental to other local authority areas. This would allow other local authorities to operate lane rental schemes but on condition that certain other criteria were met, for example, a permit scheme was in operation. This could be on a limited basis or it could be deployed more widely. It would be for authorities to ask for approval from the Government for schemes. Option 3: Using permit schemes to deliver the key objectives of lane rental. This would involve adding a new ‘super permit’ for works on the most congested roads. This would allow those permitting authorities to include this new level of permit without the need for any approval from the Government. The DfT said there was no preferred option at this stage. Cllr Martin Tett, the Local Government Association’s transport spokesman, said: ‘We are delighted that the Government has accepted our calls and acknowledged the success of pilot schemes in London and Kent. In its impact assessment the DfT admits there are 'perverse incentives created by lane rental schemes such as delaying works until they become emergency (and exempt from charge)'. RAC roads policy spokesman Nicholas Lyes said the plans ‘could be a stroke of genius by making it in their best interest to complete works as efficiently as possible but that must not be at the expense of the quality of the work’. The consultation will run until 28th October 2017.